(CBS) For several minutes, Ryan Hamilton watched as a blind man tried to hail a cab while Chicago Cubs fans poured out of Wrigley Field. The Chicago resident was on a rooftop across the street when he noticed thousands of people passing the man, who was holding a walking stick and waving his hand in an attempt to stop a taxi. Not one car stopped — but luckily, a pedestrian did. 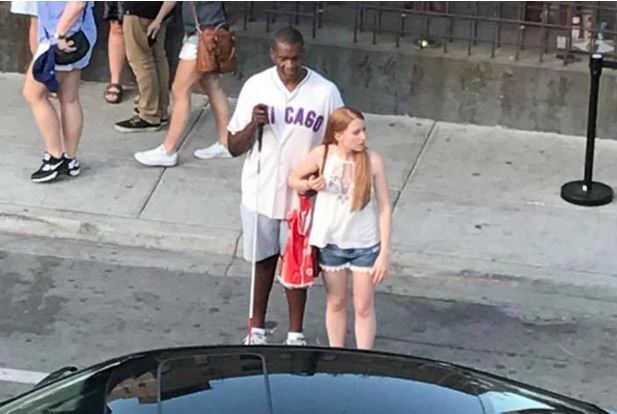 Casey Spelman, of Indianapolis, was visiting friends in the area and spotted the blind man, who was identified as Yusef Dale, an assistant U.S. attorney in Chicago, as she walked out of a Wrigleyville restaurant. Without a word, Spelman split from her friends, walked over to Dale and tapped him on the shoulder. “He said, ‘Yeah, you sound pretty, so cabs will probably stop for you before me,'” Spelman recalled Dale joking. They chatted about baseball and how crowded the area was after a Saturday afternoon game as Spelman stepped out into the street to flag down a cab. Within minutes, a taxi pulled up and Spelman helped Dale inside, giving him a hug goodbye in the process. “We laughed and exchanged goodbyes and went our separate ways,” Spelman told CBS News. The 26-year-old didn’t think anything of her encounter with Dale. But Hamilton, who was watching from above, was so touched by the kind gesture he posted pictures of the pair on Facebook, praising the woman for lending a helping hand. The next day, Spelman was surprised to see photos of herself and Dale online. Hundreds of people commented on Hamilton’s post, thanking Spelman for stopping. “Such a simple pure gesture of true genuine humanity as it should be, virtuous. Kudos! An honor to witness,” one Facebook user wrote. Spelman is glad her post is inspiring others and hopes others will step outside of their comfort zones if they encounter a similar situation.